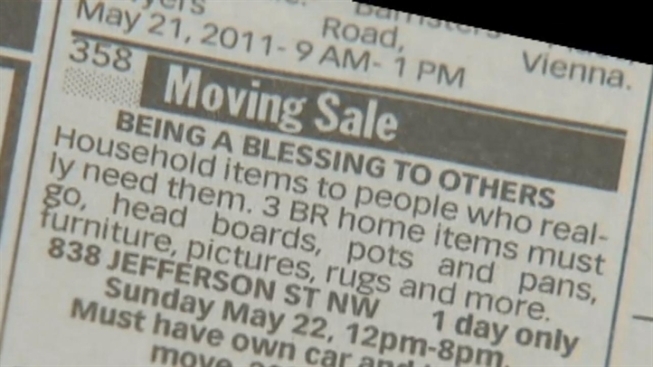 Take a look through the classifieds in the Washington Post and you will see plenty of ads for yard sales this weekend. But as some of us here at NBC Washington scanned the paper, we noticed a rather unusual ad. It is labeled as a “blessing sale,” and everything will be free. McIlwain’s guest room in her Northwest home is packed with items; some new, some antiques -- all of it spotlessly clean. She is downsizing as her daughter heads to college. And while the 30-year-veteran of the federal government is no millionaire, and has had her share of health problems, she says she is so grateful for what she has that she wants to give away things to bless others. There is only one condition that you have to meet to walk away with something from McIlwain’s “blessing sale.” Whatever you choose, you have to really need it. And McIlwain says for every person who really needs one of her things, it will be like she has been given a gift. You can check out McIlwain’s “blessing sale” this Sunday, May 22, from noon until 8 p.m. at 838 Jefferson Street NW.